"David and Goliath" redirects here. For other uses, see David and Goliath (disambiguation). This article is about the biblical warrior. For other uses, see Goliath (disambiguation). Goliath (/ɡəˈlaɪəθ/; Hebrew: גָּלְיָת, Modern Golyat, Tiberian Golyāṯ; Arabic: جالوت, Ǧālūt (Qur'anic term), جليات Ǧulyāt (Christian term)) of Gath (one of five city states of the Philistines) is a Bible character described as a giant Philistine warrior defeated by the young David, the future king of Israel. The story is told in the Bible's Books of Samuel (1 Samuel 17). The original purpose of the story was to show David's identity as the true king of Israel. 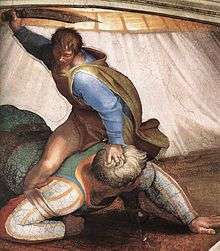 Post-Classical Jewish traditions stressed Goliath's status as the representative of paganism, in contrast to David, the champion of the God of Israel. Christian tradition gave him a distinctively Christian perspective, seeing in David's battle with Goliath the victory of God's king over the enemies of God's helpless people as a prefiguring of Jesus' victory over sin on the cross and the Church's victory over Satan. The phrase "David and Goliath" has taken on a more secular meaning, denoting an underdog situation, a contest where a smaller, weaker opponent faces a much bigger, stronger adversary. David hoists the severed head of Goliath as illustrated by Gustave Doré (1866). The account of the battle between David and Goliath is told in 1 Samuel, chapter 17. Saul and the Israelites are facing the Philistines near the Valley of Elah. Twice a day for 40 days, Goliath, the champion of the Philistines, comes out between the lines and challenges the Israelites to send out a champion of their own to decide the outcome in single combat, but Saul and all the Israelites are afraid. David, bringing food for his elder brothers, hears that Goliath had defied the armies of God and of the reward from Saul to the one that defeats him, and accepts the challenge. 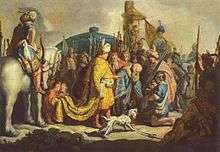 Saul reluctantly agrees and offers his armor, which David declines, taking only his staff, sling (Hebrew: קָלַ֗ע‎‎ qāla‘) and five stones from a brook. David hurls a stone from his sling with all his might and hits Goliath in the center of his forehead, Goliath falls on his face to the ground, and David cuts off his head. The Philistines flee and are pursued by the Israelites "as far as Gath and the gates of Ekron". David puts the armor of Goliath in his own tent and takes the head to Jerusalem, and Saul sends Abner to bring the boy to him. The king asks whose son he is, and David answers, "I am the son of your servant Jesse the Bethlehemite." The Book of Samuel, together with the books of Joshua, Judges and Kings, make up a unified history of Israel stretching from the entry into Canaan to the early Babylonian exile of the 6th century BCE, which biblical scholars call the Deuteronomistic history. The first edition of the history was probably written at the court of Judah's King Josiah (late 7th century) and a revised second edition during the exile (6th century), with further revisions in the post-exilic period. The Goliath story contains the traces of this in its many contradictions and illogicalities - to take a few examples, Saul finds it necessary to send for David when as the king's shield-bearer he should already be beside his royal master, and he has to ask who David is, which sits strangely with David's status at his court. These signs indicate that the Goliath story is made up of base-narrative with numerous additions made probably after the exile. David defeats Goliath, the Philistines flee the battlefield. Goliath's stature as described in various ancient manuscripts varies: the oldest manuscripts—the Dead Sea Scrolls text of Samuel, the 1st century historian Josephus, and the 4th century Septuagint manuscripts—all give his height as "four cubits and a span" (6 feet 9 inches or 2.06 metres) whereas the Masoretic Text gives this as "six cubits and a span" (9 feet 9 inches or 2.97 metres; Hebrew: שֵׁ֥שׁ אַמֹּ֖ות וָזָֽרֶת‎‎ šêš ’ammōṯ wā-zāreṯ). 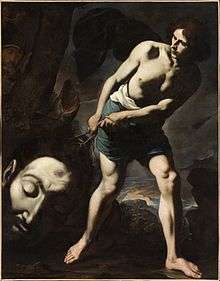 The biblical account describes Goliath as falling on his face after he is struck by a stone that sank into his forehead. British rabbi Jonathan Magonet has discussed some of the textual difficulties this raises. In the first place, he notes that archaeological information suggests that Philistine helmets generally had a forehead covering, in some cases extending down to the nose. Why (he asks) should David aim at such an impenetrable spot (and how did it hit with such force to penetrate thick bone)? And why should Goliath fall forward when struck by something heavy enough to stop him, rather than backwards? An answer to both questions, Magonet suggests, lies in the Hebrew word meitzach (מֵ֫צַח mêṣaḥ), normally translated forehead. A word almost identical with it appears earlier in the passage—the word mitzchat (מִצְחַת miṣḥaṯ), translated as "greaves"—the flexible leg-armour that protected Goliath's lower leg (see I Samuel 17: 6). It is possible, grammatically in the passage, for the same word to be used in verse 49, a reconstruction of which, replacing מֵ֫צַח with מִצְחַת, would imply that the stone sank down behind Goliath's leg-armour (as his leg was bent), making it impossible for him to straighten his leg, and causing him to stumble and fall. Then David removed the head of Goliath to show all that the giant was killed. A Goliath makes another appearance in 2 Samuel 21:19, which tells how Goliath the Gittite was killed by "Elhanan the son of Jaare-oregim, the Bethlehemite." The fourth-century BC 1 Chronicles explains the second Goliath by saying that Elhanan "slew Lahmi the brother of Goliath", apparently constructing the name Lahmi from the last portion of the word "Bethlehemite" ("beit-ha’lahmi"). The King James Bible translators adopted this into their translation of 2 Samuel 21:18–19, although the Hebrew text at this point makes no mention of the word "brother". "Most likely, storytellers displaced the deed from the otherwise obscure Elhanan onto the more famous character, David." Tell es-Safi, the biblical Gath and traditional home of Goliath, has been the subject of extensive excavations by Israel's Bar-Ilan University. The archaeologists have established that this was one of the largest of the Philistine cities until destroyed in the ninth century BC, an event from which it never recovered. A potsherd discovered at the site, and reliably dated to the tenth to mid-ninth centuries BC, is inscribed with the two names "alwt" and "wlt". While the names are not directly connected with the biblical Goliath, they are etymologically related and demonstrate that the name fits with the context of late-tenth/early-ninth-century BC Philistine culture. The name "Goliath" itself is non-Semitic and has been linked with the Lydian king Alyattes, which also fits the Philistine context of the biblical Goliath story. A similar name, Uliat, is also attested in Carian inscriptions Aren Maeir, director of the excavation, comments: "Here we have very nice evidence [that] the name Goliath appearing in the Bible in the context of the story of David and Goliath … is not some later literary creation." The underlying purpose of the story of Goliath is to show that Saul is not fit to be king (and that David is). Saul was chosen to lead the Israelites against their enemies, but when faced with Goliath he refuses to do so; Goliath is a giant, and Saul is a very tall man. His exact height is not given, but he was a head taller than anyone else in all Israel (1 Samuel 9:2), which implies he was over 6 feet (1.8 m) tall and the obvious challenger for Goliath. Also, Saul's armour and weaponry are apparently no worse than Goliath's (and David, of course, refuses Saul's armour in any case). "David declares that when a lion or bear came and attacked his father's sheep, he battled against it and killed it, [but Saul] has been cowering in fear instead of rising up and attacking the threat to his sheep (i.e. Israel)." The armor described in 1 Samuel 17 appears typical of Greek armor of the sixth century BC rather than of Philistines' armor of the tenth century. Narrative formulae such as the settlement of battle by single combat between champions has been thought characteristic of the Homeric epics (the Iliad), rather than of the ancient Near East. The designation of Goliath as a איש הביניים, "man of the in-between" (a longstanding difficulty in translating 1 Samuel 17) appears to be a borrowing from Greek "man of the metaikhmion (μεταίχμιον)", i.e. the space between two opposite army camps where champion combat would take place. A story very similar to that of David and Goliath appears in the Iliad, written circa 760–710 BC, where the young Nestor fights and conquers the giant Ereuthalion. Each giant wields a distinctive weapon—an iron club in Ereuthalion's case, a massive bronze spear in Goliath's; each giant, clad in armor, comes out of the enemy's massed array to challenge all the warriors in the opposing army; in each case the seasoned warriors are afraid, and the challenge is taken up by a stripling, the youngest in his family (Nestor is the twelfth son of Neleus, David the seventh or eighth son of Jesse). In each case an older and more experienced father figure (Nestor's own father, David's patron Saul) tells the boy that he is too young and inexperienced, but in each case the young hero receives divine aid and the giant is left sprawling on the ground. Nestor, fighting on foot, then takes the chariot of his enemy, while David, on foot, takes the sword of Goliath. The enemy army then flees, the victors pursue and slaughter them and return with their bodies, and the boy-hero is acclaimed by the people. According to the Babylonian Talmud (Sotah 42b) Goliath was a son of Orpah, the sister-in-law of Ruth, David's own great grandmother (Ruth → Obed → Jesse → David). Ruth Rabbah, a haggadic and homiletic interpretation of the Book of Ruth, makes the blood-relationship even closer, considering Orpah and Ruth to have been full sisters. Orpah was said to have made a pretense of accompanying Ruth but after forty paces left her. Thereafter she led a dissolute life. According to the Jerusalem Talmud Goliath was born by polyspermy, and had about one hundred fathers. The Talmud stresses the thrasonical Goliath's ungodliness: his taunts before the Israelites included the boast that it was he who had captured the Ark of the Covenant and brought it to the temple of Dagon; and his challenges to combat were made at morning and evening in order to disturb the Israelites in their prayers. His armour weighed 60 tons, according to rabbi Hanina; 120, according to rabbi Abba bar Kahana; and his sword, which became the sword of David, had marvellous powers. On his death it was found that his heart carried the image of Dagon, who thereby also came to a shameful downfall. In Pseudo-Philo, believed to have been composed between 135 BC and 70 AD, David picks up seven stones and writes on them the names of his fathers, his own name, and the name of God, one name per stone; then, speaking to Goliath, he says "Hear this word before you die: were not the two woman from whom you and I were born, sisters? And your mother was Orpah and my mother Ruth ..." After David strikes Goliath with the stone he runs to Goliath before he dies and Goliath says "Hurry and kill me and rejoice." and David replies "Before you die, open your eyes and see your slayer." Goliath sees an angel and tells David that it is not he who has killed him but the angel. Pseudo-Philo then goes on to say that the angel of the Lord changes David's appearance so that no one recognizes him, and thus Saul asks who he is. Goliath appears in chapter 2 of the Qur'an (2: 247–252), in the narrative of David and Saul's battle against the Philistines. Called "Jalut" in Arabic, Goliath's mention in the Qur'an is concise, though it remains a parallel to the account in the Hebrew Bible. Muslim scholars have tried to trace Goliath's origins, most commonly with the Amalekites. 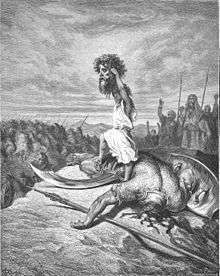 Goliath, in early scholarly tradition, became a kind of byword or collective name for the oppressors of the Israelite nation before David. Muslim tradition sees the battle with the Philistines as a prefiguration of Muhammad's battle of Badr, and sees Goliath as parallel to the enemies that the Prophet faced. American actor Ted Cassidy portrayed Goliath in the TV series Greatest Heroes of the Bible in 1978. Italian actor Luigi Montefiori portrayed this nine-foot-tall giant in Paramount's 1985 live-action movie King David as part of a flashback. The PBS series Wishbone featured Goliath in its first-season episode "Little Big Dog". Big Idea's popular VeggieTales episode was called "Dave and the Giant Pickle", where Phil Vischer voiced Goliath. In 1972, Toho and Tsuburaya Productions collaborated on a movie called Daigoro vs. Goliath, which follows the story relatively closely but recasts the main characters as Kaiju. In 2005, Lightstone Studios released a direct-to-DVD movie musical titled "One Smooth Stone", which was later changed to "David and Goliath". It is part of the Liken the Scriptures (now just Liken) series of movie musicals on DVD based on scripture stories. Thurl Bailey, a former NBA basketball player, was cast to play the part of Goliath in this film. In 2009, NBC aired Kings which has a narrative loosely based on the Biblical story of King David, but set in a kingdom that culturally and technologically resembles the present-day United States. The part of Goliath is portrayed by a tank, which David destroys with a shoulder fired rocket launcher. Goliath was portrayed by Conan Stevens in the 2013 TV miniseries The Bible. The Italians used Goliath as an action superhero in a series of Biblical adventure films (peplums) in the early 1960s. He possessed amazing strength, and the films were similar in theme to their Hercules and Maciste movies. After the classic Hercules (1958) became a blockbuster sensation in the film industry, a 1959 Steve Reeves film Terrore dei Barbari (Terror of the Barbarians) was retitled Goliath and the Barbarians in the United States, (after Joseph E. Levine claimed the sole right to the name of Hercules); the film was so successful at the box office, it inspired Italian filmmakers to do a series of four more films featuring a beefcake hero named Goliath, although the films were not really related to each other. (The 1960 Italian film David and Goliath starring Orson Welles was not one of these, since that movie was a straightforward adaptation of the Biblical story). Both Goliath and the Vampires (1961) and Goliath and the Sins of Babylon (1963) actually featured the famed superhero Maciste in the original Italian versions, but American distributors didn't feel the name Maciste had any meaning to American audiences. Goliath and the Dragon (1960) was originally an Italian Hercules movie called The Revenge of Hercules. 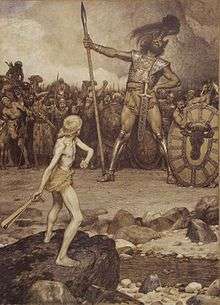 Modern usage of "David and Goliath"
In recent usage, the phrase "David and Goliath" has taken on a secular meaning, denoting an underdog situation, a contest where a smaller, weaker opponent faces a much bigger, stronger adversary; if successful, the underdog may win in an unusual or surprising way. It is arguably the most famous underdog story. Theology professor Leonard Greenspoon, in his essay, "David vs. Goliath in the Sports Pages", explains that "most writers use the story for its underdog overtones (the little guy wins) ... Less likely to show up in newsprint is the contrast that was most important to the biblical authors: David's victory shows the power of his God, while Goliath's defeat reveals the weakness of the Philistine deities." The phrase is widely used in news media, to succinctly characterize underdog situations in every conceivable context, without religious overtones. Recent headlines include: sports ("Haye relishes underdog role in 'David and Goliath' fight with Nikolai Valuev"—The Guardian); business ("On Internet, David-and-Goliath Battle Over Instant Messages"—The New York Times); science ("David and Goliath: How a tiny spider catches much larger prey"—ScienceDaily; politics ("Dissent in Cuba: David and Goliath"—The Economist); social justice ("David-and-Goliath Saga Brings Cable to Skid Row"—Los Angeles Times). ↑ Compare texts of short and long versions of 1 Samuel 17. 1 2 3 Hays, J. Daniel (December 2005). "Reconsidering the Height of Goliath" (Portable Document File). Journal of the Evangelical Theological Society. 48 (4): 701–14. ↑ Frontain, Raymond-Jean; Jan Wojcik, eds. (1980). The David Myth in Western Literature. Purdue University Press. p. 57. Retrieved 2014-04-28. 1 2 "David and Goliath". Oxford Advanced American Dictionary. Retrieved 11 February 2015. "used to describe a situation in which a small or weak person or organization tries to defeat another much larger or stronger opponent": "The game looks like it will be a David and Goliath contest." ↑ Many English translations give "The Lord" at this point for the Hebrew YHWH, which is not normally written in full as Yahweh or Jehovah. ↑ Campbell & O'Brien 2000, p. 2 and fn6. ↑ Person 2010, p. 10–11. ↑ Campbell & O'Brien 2000, p. 262 fn62. ↑ Campbell & O'Brien 2000, p. 259-260 fn58. ↑ Johnson 2015, p. 10-11. ↑ Ralph W. Klein, Narrative Texts: Chronicles, Ezra and Nehemiah, see section "Representative Changes in Chronicles of Texts Taken from Samuel-Kings". Compare 1 Samuel 16:1, "I will send you to Jesse the Bethlehemite (beit-ha’lahmi), for I have found among his sons a king for me." ↑ Tell es-Safi/Gath weblog and Bar-Ilan University; For the editio princeps and an in-depth discussion of the inscription, see now: Maeir, A.M., Wimmer, S.J., Zukerman, A., and Demsky, A. (2008 (in press)). "An Iron Age I/IIA Archaic Alphabetic Inscription from Tell es-Safi/Gath: Paleography, Dating, and Historical-Cultural Significance". Bulletin of the American Schools of Oriental Research. ↑ Vernet Pons, M. (2012). "The etymology of Goliath in the light of Carian Wljat/Wliat: a new proposal". Kadmos, 51, 143–164. ↑ "Tall tale of a Philistine: researchers unearth a Goliath cereal bowl". The Sydney Morning Herald. Reuters. November 15, 2005. ↑ Azzan Yadin, "Goliath's Armor and the Israelite Collective Memory", appeared in Vetus Testamentum 54:373–95 (2004). See also Israel Finkelstein, "The Philistines in the Bible: A Late Monarchic Perspective", Journal for the Study of the Old Testament, 27:131:67. For a brief online overview, see Higgaion, a blog by Christopher Heard, Associate Professor of Religion at Pepperdine University. ↑ Israel Finkelstein; Neil Asher Silberman (3 April 2007). David and Solomon: In Search of the Bible's Sacred Kings and the Roots of the Western Tradition. Simon and Schuster. pp. 198–. ISBN 978-0-7432-4363-6. ↑ Homer, Iliad Book 7 ll.132–160. ↑ M.L. West, The East Face of Helicon. West Asiatic Elements in Greek Poetry and Myth, Clarendon Press, Oxford 1997 pp. 370, 376. ↑ Jerusalem Talmud Yebamoth, 24b. ↑ For a brief overview of Talmudic traditions on Goliath, see Jewish Encyclopedia, "Goliath". ↑ Charlesworth, James H. 1983. The Old Testament pseudepigrapha vol 2. Garden City, N.Y.: Doubleday. ISBN 0-385-18813-7 p. 374. ↑ "'Greatest Heroes of the Bible' David & Goliath (TV episode 1978)". imdb. Retrieved 2011-04-28. ↑ Alston, Joshua (16 July 2009). "WHAT WOULD JESUS WATCH?". Newsweek. NEWSWEEK LLC. Retrieved 19 June 2016. ↑ "David and Goliath". Macmillan Dictionary. Retrieved 11 February 2015. "used for describing a situation in which a small person or organization defeats a much larger one in a surprising way"
↑ Bodner, Keith. "David and Goliath (1 Sam 17)". Society of Biblical Literature. Retrieved 18 February 2015. ↑ Greenspoon, Leonard. "David vs. Goliath in the Sports Pages". Society of Biblical Literature. Retrieved 12 February 2015. ↑ McRae, Donald (3 November 2009). "Haye relishes underdog role in 'David and Goliath' fight with Nikolai Valuev". The Guardian. London. Retrieved 3 November 2009. Smaller boxer battles gigantic WBA world heavyweight champion. ↑ Blair, Jayson (24 June 2000). "On Internet, David-and-Goliath Battle Over Instant Messages". The New York Times. Retrieved 27 March 2015. Tiny online start-up battles Internet giant. ↑ "David and Goliath: How a tiny spider catches much larger prey". ScienceDaily. 12 June 2014. Retrieved 10 February 2016. Tiny spider preys on ants up to almost four times its size. ↑ "Dissent in Cuba: David and Goliath". The Economist. 16 January 2003. Retrieved 27 March 2015. "A one-party election faces a small but unprecedented challenge." ↑ Rivera, Carla (21 November 2001). "David-and-Goliath Saga Brings Cable to Skid Row". Los Angeles Times. Retrieved 27 March 2015. Skid row resident battles telecoms giant to win cable access. Campbell, Antony F.; O'Brien, Mark A. (2000). Unfolding the Deuteronomistic History. Fortress Press. Johnson, Benjamin J.M. (2015). Reading David and Goliath in Greek and Hebrew: A Literary Approach. Mohr Siebeck. Person, Raymond F. (2010). The Deuteronomic History and the Book of Chronicles. Society of Biblical Literature. West, M.L. (1997). The East Face of Helicon. Clarendon Press.